Description: This perennial sedge consists of rosettes of basal leaves, from which flowering stalks (culms) about 1-2' long occasionally develop. The culms ascend upward or they hang sideways at maturity; they are hairless and green. The basal leaves are up to 12" long and 1¼" (3 cm.) across; they are dark green, widely spreading to ascending, hairless, and evergreen. The upper surface of each basal leaf has a prominent midrib and 2 lateral veins that are also conspicuous. The leaves along the culms are reduced to reddish purple sheaths that are tubular in shape; very similar sheath-like bracts also occur underneath each spikelet of the inflorescence, where their tips extend up to ½" beyond the culm. The inflorescence consists of 2-4 pistillate (female) spikelets and a terminal staminate (male) spikelet; these spikelets are erect to ascending and rather widely spaced apart along the culm. Each pistillate spikelet is longer than the tip of the sheath-like bract underneath it. The staminate spikelet is reddish purple and up to ¾" long; it has a peduncle that is about as long as the spikelet. Each pistillate spikelet is about ½–1½" long and somewhat cylindrical in shape; it consists of about 4-12 perigynia and their scales. The lowermost pistillate spikelet has a peduncle up to ¾" long, while the remaining pistillate spikelets have short peduncles or they are sessile. Each perigynium is about 4.0–4.5 mm. long and 1.5–2.0 mm. across; it is ovoid-ellipsoid in shape, 3-angled, light green, and hairless. The outer surface of each perigynium has several fine veins that run along its length. Each pistillate scale is a little shorter than its perigynium; it is ovate and membranous, except for a narrow central vein that is green. The tip of each pistillate scale is often tinted light purple. The blooming period occurs during mid-spring. Pollination is by wind. The achenes are about 2.5 mm. long, ovoid, and 3-angled; each achene has a short beak at its apex that is straight or curves outward, while at the base it has a short stipe (basal beak). This sedge has fibrous roots and short rhizomes; it often forms clumps of vegetative shoots. Cultivation: The preference is light to medium shade and consistently damp soil with some organic matter. This sedge is typically found in protected areas where the temperature is cool and the humidity is high. Range & Habitat: The native Plantain-Leaved Sedge is a rare plant in Illinois; it was collected in Cook County over a century ago, and more recently it was discovered in Johnson County in southern Illinois (see Distribution Map). Illinois lies at the western range limit of this species; it is more common in areas to the east of the state. Habitats include rich deciduous woodlands, wooded slopes and ravines, and canyon-like gorges in wooded mountainous areas. This sedge and many ferns prefer the same kinds of habitat and can be found growing in proximity to each other. Faunal Associations: Various insects feed on the foliage of sedges (Carex spp. ), including the caterpillars of the woodland butterfly, Satyrodes appalachia (Appalachian Brown). The seeds of sedges are an attractive source of food to various kinds of birds – for woodland sedges, this would include Wild Turkey and the chicks of Ruffed Grouse. Photographic Location: A sandstone ravine at Shades State Park in west-central Indiana. 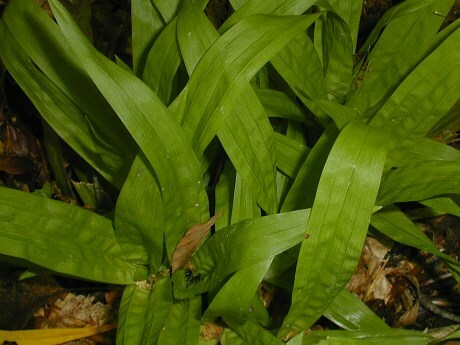 Comments: Plantain-Leaved Sedge is a member of a small group of sedges that have unusually broad leaves. These sedges are invariably found in wooded areas and they are tolerant of shade. Their foliage is quite attractive in appearance and Plantain-Leaved Sedge is no exception in this regard. This latter sedge can be distinguished from the others by the short sheath-like bracts of the inflorescence and the lack of true leaf blades on the flowering culms. The exerted tips of these bracts are no more than ½" in length and they are invariably shorter than the adjacent pistillate spikelets. Other sedges in this group have larger leafy bracts in the inflorescence that often equal or exceed the length of the pistillate spikelets. 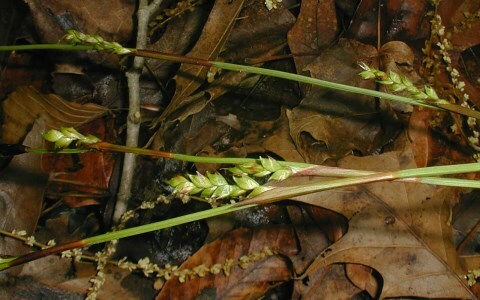 Furthermore, unlike some sedges of this group, both the sheaths and sheath-like bracts of Plantain-Leaved Sedge are conspicuously reddish purple, while the evergreen foliage is dark green. In sharp contrast, another species in this group, Carex albursina (White Bear Sedge), has pale green foliage. This latter species is more common in Illinois.